This review aims to arm readers with a deep understanding of pharmacokinetics of digoxin. Pharmacology and pharmacokinetic references texts, and peer reviewed medical journal manuscripts indexed on Medline included based on currency, accuracy and appropriateness. A thorough understanding of digoxin pharmacokinetics in the older person is essential for improved therapeutic outcomes, improved compliance, reduced morbidity and improved quality of life. Keywords: Ageing, digoxin, pharmacokinetics, toxicity..
© Currie et al. ; Licensee Bentham Open. Pharmacokinetics examines the absorption, distribution, metabolism and excretion (ADME) of drugs, and the associated toxic or therapeutic responses [1Jambhekar SS, Breen PJ. Basic pharmacokinetics. London: Pharmaceutical Press 2009.-4Winter ME. Basic clinical pharmacokinetics. 4th. Philadelphia: Lippincott Williams Wilkins 2004.]. Pharmacokinetics includes applications in bioavailability, variations due to physiological or pathological conditions, disease related dose adjustment, drug interactions, and customisation of drug dosage regimes [1Jambhekar SS, Breen PJ. Basic pharmacokinetics. London: Pharmaceutical Press 2009.-4Winter ME. Basic clinical pharmacokinetics. 4th. Philadelphia: Lippincott Williams Wilkins 2004.]. An important division of pharmacology closely related to pharmacokinetics is the study of factors affecting bioavailability to optimise therapeutic activity of drugs, known as biopharmaceutics [1Jambhekar SS, Breen PJ. Basic pharmacokinetics. London: Pharmaceutical Press 2009., 2Shargel L, Wu-Pong S, Yu ABC. Applied biopharmaceutics and pharmacokinetics. 5th. New York: McGraw Hill 2005.]. The underlying principle of pharmacokinetics and the focus of this discussion is consistent with the philosophy of Paracelsus (medieval alchemist) who suggested that “only the dose makes a thing not a poison” [1Jambhekar SS, Breen PJ. Basic pharmacokinetics. London: Pharmaceutical Press 2009.]. Within a window, a specific drug will offer therapeutic benefit and outside that window there will either be no therapeutic benefit or toxicity. The narrow therapeutic range of digoxin means that small variations in blood concentration may easily result in toxic or sub therapeutic concentrations. To maintain concentrations within the therapeutic range requires consistent bioavailability and careful management of factors that may influence bioavailability. Thus the aging body presents variations to physiological and pathological status that can have a profound influence on bioavailability, pharmacological response, drug sensitivity and drug interactions. The changes associated with the elderly demand more astute medication management and monitoring. Physiologic changes and disease occur with aging and can affect drug pharmacokinetics in older persons [5Cusack BJ. Pharmacokinetics in older persons Am J Geriatr Pharmacother 2004; 2: 274-302., 6Delafuente JC. Pharmacokinetic and pharmacodynamic alterations in the geriatric patient Consult Pharm 2008; 23: 324-4.]. Older people can not only have altered function but they can also have altered responses to the drugs themselves relating to mechanical responses, receptor mechanisms, homeostatic changes and CNS function [7El Desoky ES. Pharmacokinetic-pharmacodynamic crisis in the elderly Am J Ther 2007; 14: 488-98.,8Ewing AB. Altered drug response in the elderly In: Armour D, Cairns C, Eds. Medicines in the elderly. London: Pharmaceutical Press 2002.]. The high prevalence of disease in the elderly also results in a higher use of medications and the incidence of adverse drug effects correlates with age [9McLean AJ, Le Couteur DG. Aging biology and geriatric clinical pharmacology Pharmacol Rev 2004; 56: 163-84.]. As many as 20% of hospitalisations in the elderly are due to adverse effects of medications and 18% of hospital deaths in the elderly are associated with adverse effects of medications [9McLean AJ, Le Couteur DG. Aging biology and geriatric clinical pharmacology Pharmacol Rev 2004; 56: 163-84.]. Perhaps the most important consideration for drug use and response in the elderly is that there is greater heterogeneity in older populations than younger people which means not only that there is significant variation is disease states but also significant variations in responses to medications [10Kostrzewski A. Cardiovascular medicines in the elderly In: Armour D, Cairns C, Eds. Medicines in the elderly. London: Pharmaceutical Press 2002.]. No doubt the under representation of the elderly in pharmaceutical clinical trials contributes to adverse effects in this cohort [9McLean AJ, Le Couteur DG. Aging biology and geriatric clinical pharmacology Pharmacol Rev 2004; 56: 163-84.]. Altered absorption (eg. slower gut or transdermal absorption). 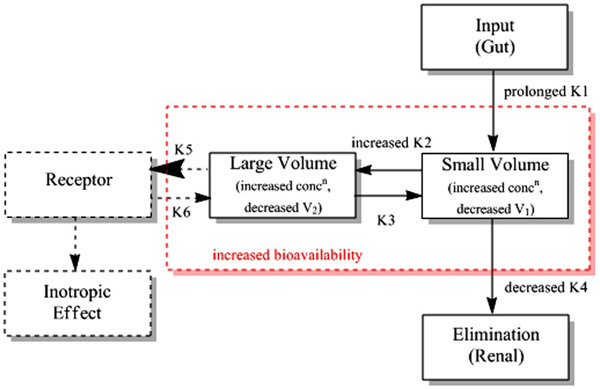 Changed bioavailability (eg. increased for highly extracted drugs). Changed biodistribution (eg. more extensive for lipid soluble drugs and less extensive in water soluble drugs). Altered metabolism (eg. cytochrome based metabolism in the liver). Altered elimination (eg. slower renal excretion) [5Cusack BJ. Pharmacokinetics in older persons Am J Geriatr Pharmacother 2004; 2: 274-302., 6Delafuente JC. Pharmacokinetic and pharmacodynamic alterations in the geriatric patient Consult Pharm 2008; 23: 324-4., 11Mangoni AA, Jackson SHD. Age-related changes in pharmacokinetics and pharmacodynamics: basic principles and practical applications Br J Clin Pharmacol 2003; 57: 6-14.]. Irrespective of age related changes to absorption, distribution, metabolism and excretion, older people also demonstrate an increased sensitivity to many drugs due to comorbidity and polypharmacy [7El Desoky ES. Pharmacokinetic-pharmacodynamic crisis in the elderly Am J Ther 2007; 14: 488-98.]. The elderly are at higher risk of an adverse drug effect, have increased severity of effects, are less likely to report adverse effects and are more likely to be hospitalised or die due to adverse drug effects [9McLean AJ, Le Couteur DG. Aging biology and geriatric clinical pharmacology Pharmacol Rev 2004; 56: 163-84.]. Pharmacokinetic changes due to age related physiological variations demand attention toward dose requirements in older people [5Cusack BJ. Pharmacokinetics in older persons Am J Geriatr Pharmacother 2004; 2: 274-302., 6Delafuente JC. Pharmacokinetic and pharmacodynamic alterations in the geriatric patient Consult Pharm 2008; 23: 324-4.]. Nonetheless, it is often difficult to differentiate pharmacokinetic changes resulting from aging from coexisting environmental influences, disease and other medications [12Durnas C, Loi CM, Cusck BJ. Hepatic drug metabolism and aging Clin Pharmacokinet 1990; 19: 359-89.]. Consequently, drug therapy is difficult to predict in an older person so medication should be started at a low dose and increased this slowly with close monitoring of benefits and adverse effects [12Durnas C, Loi CM, Cusck BJ. Hepatic drug metabolism and aging Clin Pharmacokinet 1990; 19: 359-89., 13Wynne H. Drug metabolism and ageing J Br Menopause Soc 2005; 11: 51-6.]. With increasing age the amount of saliva produced is often reduced and this can reduce the rate of drug absorption by influencing the gastric pH [2Shargel L, Wu-Pong S, Yu ABC. Applied biopharmaceutics and pharmacokinetics. 5th. New York: McGraw Hill 2005., 8Ewing AB. Altered drug response in the elderly In: Armour D, Cairns C, Eds. Medicines in the elderly. London: Pharmaceutical Press 2002.]. Furthermore, older people have reduced gastric acid secretion and reduced acidity (increased pH) which can delay dissolution of oral medications [2Shargel L, Wu-Pong S, Yu ABC. Applied biopharmaceutics and pharmacokinetics. 5th. New York: McGraw Hill 2005., 3Ritschel WA, Kearns GL. Handbook of basic pharmacokinetcis including clinical applications. 6th. Washington: American Pharmacists Association 2004., 8Ewing AB. Altered drug response in the elderly In: Armour D, Cairns C, Eds. Medicines in the elderly. London: Pharmaceutical Press 2002., 9McLean AJ, Le Couteur DG. Aging biology and geriatric clinical pharmacology Pharmacol Rev 2004; 56: 163-84.]. This is exacerbated by delayed gastric empty due to reduced peristaltic force that reduces the mechanical influences on medication mixing with gastric juices [3Ritschel WA, Kearns GL. Handbook of basic pharmacokinetcis including clinical applications. 6th. Washington: American Pharmacists Association 2004., 8Ewing AB. Altered drug response in the elderly In: Armour D, Cairns C, Eds. Medicines in the elderly. London: Pharmaceutical Press 2002., 9McLean AJ, Le Couteur DG. Aging biology and geriatric clinical pharmacology Pharmacol Rev 2004; 56: 163-84.]. The surface area for drug absorption is also decreased in aging due to intestinal atrophy which, combined with reduced concentration gradient due to the poorer blood flow, inhibit passive diffusion of drugs into the blood stream further delaying absorption rate [8Ewing AB. Altered drug response in the elderly In: Armour D, Cairns C, Eds. Medicines in the elderly. London: Pharmaceutical Press 2002.]. While this does not change the total absorption itself, it does alter the time to maximum drug effect [3Ritschel WA, Kearns GL. Handbook of basic pharmacokinetcis including clinical applications. 6th. Washington: American Pharmacists Association 2004., 8Ewing AB. Altered drug response in the elderly In: Armour D, Cairns C, Eds. Medicines in the elderly. London: Pharmaceutical Press 2002.]. Generally speaking, most orally administered drugs (like digoxin) are not required to be altered on the basis of age related changes in gastrointestinal function [8Ewing AB. Altered drug response in the elderly In: Armour D, Cairns C, Eds. Medicines in the elderly. London: Pharmaceutical Press 2002.]. A number of studies have shown factors contributing to absorption are generally not physiological changes but rather to various disease states [11Mangoni AA, Jackson SHD. Age-related changes in pharmacokinetics and pharmacodynamics: basic principles and practical applications Br J Clin Pharmacol 2003; 57: 6-14.]. Drug distribution in the older person can vary due to changes in body composition and critical organ perfusion (due to reduced cardiac output and increased peripheral vascular resistance) [3Ritschel WA, Kearns GL. Handbook of basic pharmacokinetcis including clinical applications. 6th. Washington: American Pharmacists Association 2004., 8Ewing AB. Altered drug response in the elderly In: Armour D, Cairns C, Eds. Medicines in the elderly. London: Pharmaceutical Press 2002.]. The latter will also affect metabolism and elimination with decreased liver and kidney perfusion. The reduction in lean body mass in older people (as much as 19%) will cause an elevation in drug concentrations in muscles for drugs distributed in that manner (eg. digoxin) [8Ewing AB. Altered drug response in the elderly In: Armour D, Cairns C, Eds. Medicines in the elderly. London: Pharmaceutical Press 2002.,14Turnheim K. When drug therapy gets old: pharmacokinetics and pharmacodynamics in the elderly Exp Gerontol 2003; 38: 843-53.]. The older body also sees an increase of up to 20-40% in the relative fat composition (adipose tissue) independently of obesity and, despite the increase in fat, older people have a marked decrease in water content of the body of 10-15% [8Ewing AB. Altered drug response in the elderly In: Armour D, Cairns C, Eds. Medicines in the elderly. London: Pharmaceutical Press 2002., 9McLean AJ, Le Couteur DG. Aging biology and geriatric clinical pharmacology Pharmacol Rev 2004; 56: 163-84., 14Turnheim K. When drug therapy gets old: pharmacokinetics and pharmacodynamics in the elderly Exp Gerontol 2003; 38: 843-53.]. The effects of these changes on drug distribution will largely depend on the lipid or water solubility nature of the drug [8Ewing AB. Altered drug response in the elderly In: Armour D, Cairns C, Eds. Medicines in the elderly. London: Pharmaceutical Press 2002.] and its metabolites. Water soluble drugs (like digoxin) will show a small volume of distribution (V), increased plasma concentrations with reduced total body water and, thus, accommodation needs to be made in reducing loading doses [8Ewing AB. Altered drug response in the elderly In: Armour D, Cairns C, Eds. Medicines in the elderly. London: Pharmaceutical Press 2002.,11Mangoni AA, Jackson SHD. Age-related changes in pharmacokinetics and pharmacodynamics: basic principles and practical applications Br J Clin Pharmacol 2003; 57: 6-14.,14Turnheim K. When drug therapy gets old: pharmacokinetics and pharmacodynamics in the elderly Exp Gerontol 2003; 38: 843-53.]. Conversely, lipid soluble drugs, will have a larger volume of distribution and, thus, a longer half life [11Mangoni AA, Jackson SHD. Age-related changes in pharmacokinetics and pharmacodynamics: basic principles and practical applications Br J Clin Pharmacol 2003; 57: 6-14.]. The half life of water soluble drugs does not reduce because of the concomitant reduced renal clearance. From the equation below, it is clear that a reduction in V in older patients with concomitant reduction in renal clearance will cancel one another out while the renal reduction potentiates the effects of increased V on half life. A 10% decrease in blood albumin concentration has the effect of increasing the unbound fraction of the drug by a corresponding 10% [9McLean AJ, Le Couteur DG. Aging biology and geriatric clinical pharmacology Pharmacol Rev 2004; 56: 163-84.]. The vast majority of drug metabolism occurs in the liver with minor contributions from the kidney and lung [8Ewing AB. Altered drug response in the elderly In: Armour D, Cairns C, Eds. Medicines in the elderly. London: Pharmaceutical Press 2002.]. The capacity of the liver to metabolise drugs decreases with age [6Delafuente JC. Pharmacokinetic and pharmacodynamic alterations in the geriatric patient Consult Pharm 2008; 23: 324-4.]. The 35-40% reduction in hepatic perfusion in the elderly has a significant impact on drug delivery to the liver and subsequent rate of metabolism [8Ewing AB. Altered drug response in the elderly In: Armour D, Cairns C, Eds. Medicines in the elderly. London: Pharmaceutical Press 2002., 12Durnas C, Loi CM, Cusck BJ. Hepatic drug metabolism and aging Clin Pharmacokinet 1990; 19: 359-89., 13Wynne H. Drug metabolism and ageing J Br Menopause Soc 2005; 11: 51-6.]. Liver size can be reduced by about 24-35% with age [13Wynne H. Drug metabolism and ageing J Br Menopause Soc 2005; 11: 51-6.]. One major influence is the reduced first pass metabolism of orally absorbed lipid soluble drugs which can significantly increase drug bioavailability [8Ewing AB. Altered drug response in the elderly In: Armour D, Cairns C, Eds. Medicines in the elderly. London: Pharmaceutical Press 2002.]. Conversely, prodrugs that require metabolism for activation may show decreased or delayed bioavailability [11Mangoni AA, Jackson SHD. Age-related changes in pharmacokinetics and pharmacodynamics: basic principles and practical applications Br J Clin Pharmacol 2003; 57: 6-14.]. Digoxin is not strongly influenced by first pass metabolism or hepatic metabolism. While no significant decrease occurs in phase II metabolism, there is a decrease in clearance of drugs metabolised by phase I pathways [9McLean AJ, Le Couteur DG. Aging biology and geriatric clinical pharmacology Pharmacol Rev 2004; 56: 163-84.]. Furthermore, the decreased capacity (up to 60%) of the liver to metabolise drugs for elimination can increase plasma concentrations and prolong biological half lives of drugs [8Ewing AB. Altered drug response in the elderly In: Armour D, Cairns C, Eds. Medicines in the elderly. London: Pharmaceutical Press 2002.]. It has been recently reported that age related renal dysfunction contributes to decreased liver metabolism of drugs in older people [11Mangoni AA, Jackson SHD. Age-related changes in pharmacokinetics and pharmacodynamics: basic principles and practical applications Br J Clin Pharmacol 2003; 57: 6-14.]. Finally, the reduction in first pass metabolism and decreased liver capacity to manage toxins contribute to an increase in adverse effects in the elderly. For water soluble drugs, like digoxin, elimination is solely or primarily via renal excretion [8Ewing AB. Altered drug response in the elderly In: Armour D, Cairns C, Eds. Medicines in the elderly. London: Pharmaceutical Press 2002., 9McLean AJ, Le Couteur DG. Aging biology and geriatric clinical pharmacology Pharmacol Rev 2004; 56: 163-84., 11Mangoni AA, Jackson SHD. Age-related changes in pharmacokinetics and pharmacodynamics: basic principles and practical applications Br J Clin Pharmacol 2003; 57: 6-14.]. In the elderly (compared to young adults), the kidneys can show a 20% reduction in size, 30% reduction in glomeruli function (elimination of drugs relates to glomeruli filtration rate), and as much as 50% reduction in normal renal capacity [8Ewing AB. Altered drug response in the elderly In: Armour D, Cairns C, Eds. Medicines in the elderly. London: Pharmaceutical Press 2002.]. This functional decline can be further exacerbated by concomitant renal disease [3Ritschel WA, Kearns GL. Handbook of basic pharmacokinetcis including clinical applications. 6th. Washington: American Pharmacists Association 2004., 8Ewing AB. Altered drug response in the elderly In: Armour D, Cairns C, Eds. Medicines in the elderly. London: Pharmaceutical Press 2002.]. Renal excretion of drugs declines with age so the elderly should be managed as though they have renal insufficiency [6Delafuente JC. Pharmacokinetic and pharmacodynamic alterations in the geriatric patient Consult Pharm 2008; 23: 324-4., 14Turnheim K. When drug therapy gets old: pharmacokinetics and pharmacodynamics in the elderly Exp Gerontol 2003; 38: 843-53.]. This is particularly important for drugs with a narrow therapeutic index, like digoxin, because it increases the likelihood of serious toxicity [11Mangoni AA, Jackson SHD. Age-related changes in pharmacokinetics and pharmacodynamics: basic principles and practical applications Br J Clin Pharmacol 2003; 57: 6-14.]. While plasma creatinine levels are a poor indicator of renal function, creatinine clearance rates can be used to accommodate loading and continuing drug doses in the elderly using dose corrections like the Cockcroft and Gault equation [8Ewing AB. Altered drug response in the elderly In: Armour D, Cairns C, Eds. Medicines in the elderly. London: Pharmaceutical Press 2002., 9McLean AJ, Le Couteur DG. Aging biology and geriatric clinical pharmacology Pharmacol Rev 2004; 56: 163-84.]. This is essential for drugs that are highly toxic and which have a narrow therapeutic range like digoxin [8Ewing AB. Altered drug response in the elderly In: Armour D, Cairns C, Eds. Medicines in the elderly. London: Pharmaceutical Press 2002.] and will be discussed in more detail below. But it is also very important to consider the effects of acute illness in the elderly that can cause a very rapid change in renal function and, for example, see a stable drug regime rapidly degenerate into toxicity following an acute illness (eg. chest infection) [8Ewing AB. Altered drug response in the elderly In: Armour D, Cairns C, Eds. Medicines in the elderly. London: Pharmaceutical Press 2002.]. Compliance is simply defined as the extent to which a patient adheres to the instructions provided for a medication [15Goodyer LI. Compliance, concordance and polypharmacy in the elderly In: Armour D, Cairns C, Eds. Medicines in the elderly. London: Pharmaceutical Press 2002.]. 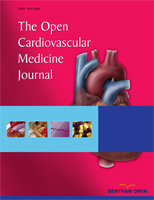 Concordance is a variation on this concept that accommodates a negotiation of the instructions between prescriber and patient to develop a medication regime that suits the patient and offers therapeutic benefit [10Kostrzewski A. Cardiovascular medicines in the elderly In: Armour D, Cairns C, Eds. Medicines in the elderly. London: Pharmaceutical Press 2002.]. Clearly the concept of concordance is aimed at addressing perceived issues in compliance. Perhaps the perception that the elderly are less compliant with medications actually relates more to medication errors than deliberate lack of compliance. Indeed, as few as 18% of the elderly in one study had compliance related problems with their medication while as many as 50% of the elderly make errors in their medications [15Goodyer LI. Compliance, concordance and polypharmacy in the elderly In: Armour D, Cairns C, Eds. Medicines in the elderly. London: Pharmaceutical Press 2002.]. Using digoxin as an example, compliance can have several significant effects. Firstly, lack of compliance can result in a reduced therapeutic effect which may be difficult to differentiate from disease progression. Secondly, the dose regime may be changed (increased dose) if compliance is not identified as being problematic. Improved compliance after dose adjustment following a period of poor compliance could result in toxicity. Polypharmacy is very important in the elderly because it relates to the relationship between the greater number of medications taken (typically high in the elderly) and the increased risk of drug interaction, decreased compliance and increased medication errors [9McLean AJ, Le Couteur DG. Aging biology and geriatric clinical pharmacology Pharmacol Rev 2004; 56: 163-84.,13Wynne H. Drug metabolism and ageing J Br Menopause Soc 2005; 11: 51-6.,15Goodyer LI. Compliance, concordance and polypharmacy in the elderly In: Armour D, Cairns C, Eds. Medicines in the elderly. London: Pharmaceutical Press 2002.-17Tsang P, Gerson B. Understanding digoxin use in the elderly patient Clin Lab Med 1990; 10: 479-92.]. Indeed, medication errors increase 15 fold with an increase in medications from 1 to 4 [15Goodyer LI. Compliance, concordance and polypharmacy in the elderly In: Armour D, Cairns C, Eds. Medicines in the elderly. London: Pharmaceutical Press 2002.]. Polypharmacy is defined by five or more prescription medications which has an incidence of 20-40% in the over 70 age group [9McLean AJ, Le Couteur DG. Aging biology and geriatric clinical pharmacology Pharmacol Rev 2004; 56: 163-84.]. Older patients are frequently prescribed multiple drugs which make them susceptible to drug-drug interactions [9McLean AJ, Le Couteur DG. Aging biology and geriatric clinical pharmacology Pharmacol Rev 2004; 56: 163-84., 16Brawn LA, Castleden CM. Adverse drug reactions. An overview of special considerations in the management of the elderly patient Drug Saf 1990; 5: 421-35.-19Hanratty CG, McGlinchey P, Johnston GD, Passmore AP. Differential pharmacokinetics of digoxin in elderly patients Drugs Aging 2000; 17: 353-62.]. Moreover, older people take more drugs with a narrow therapeutic index, increasing the risk of adverse reactions and drug interactions [16Brawn LA, Castleden CM. Adverse drug reactions. An overview of special considerations in the management of the elderly patient Drug Saf 1990; 5: 421-35.]. Unfortunately, they are also less capable of coping with reaction and interactions due to co-morbidity and altered pharmacokinetics [16Brawn LA, Castleden CM. Adverse drug reactions. An overview of special considerations in the management of the elderly patient Drug Saf 1990; 5: 421-35., 17Tsang P, Gerson B. Understanding digoxin use in the elderly patient Clin Lab Med 1990; 10: 479-92.]. Cardiac glycosides come from foxglove (digitalis) and related plants [20Rang H, Dale M, Ritter J, Flower R. Rang and Dale’s Pharmacology. 6th. London: Churchill Livingston 2008., 21Waller D, Renwick A, Hillier K. Medical pharmacology and therapeutics. 2nd. London: Elsevier 2006.] and have been used medicinally (or as a poison) since 1500BC [22Lemke T, Williams D, Roche V, Zito S. Foye’s principles of medicinal chemistry. 6th. Philadelphia: Lippincott Williams Wilkins 2008.]. The digitalis leaf was originally reported (1785) for its role as a diuretic although its influence on cardiac parameters was noted [22Lemke T, Williams D, Roche V, Zito S. Foye’s principles of medicinal chemistry. 6th. Philadelphia: Lippincott Williams Wilkins 2008., 23Sonnenblick EH, LeJemtel TH, Frishman WH. Digitalis preparations and other inotropic agents In: Frishman WH, Sonnenblick EH, Eds. Cardiovascular pharmacotherapeutics. New York: McGraw Hill 1996.]. It was not until the second half of the 19th century that the effects of digitalis glycosides on heart contraction were obvious [23Sonnenblick EH, LeJemtel TH, Frishman WH. Digitalis preparations and other inotropic agents In: Frishman WH, Sonnenblick EH, Eds. Cardiovascular pharmacotherapeutics. New York: McGraw Hill 1996.]. It was only approved by the Food and Drug Administration (FDA in USA) for use in heart failure in 1998 [24Gheorghiade M, van Veldhuisen DJ, Colucci WS. Contemporary use of digoxin in the management of cardiovascular disorders Circulation 2006; 113: 2556-64.]. The mechanism of action of cardiac glycosides is generally the same with only minor pharmacokinetic differences between individual agents (eg. digoxin, digitoxin and oubain) [25Bryant B, Knights K, Salerno E. Pharmacology for Health Professionals. 2nd. Sydney Australia: Mosby Elsevier 2007.]. Digoxin remains the most widely used cardiac glycoside (digitalis glycoside) despite the emergence of newer agents because it has few side effects when appropriate dosing is guided by serum concentrations and because it does not increase long term mortality [19Hanratty CG, McGlinchey P, Johnston GD, Passmore AP. Differential pharmacokinetics of digoxin in elderly patients Drugs Aging 2000; 17: 353-62., 21Waller D, Renwick A, Hillier K. Medical pharmacology and therapeutics. 2nd. London: Elsevier 2006., 22Lemke T, Williams D, Roche V, Zito S. Foye’s principles of medicinal chemistry. 6th. Philadelphia: Lippincott Williams Wilkins 2008., 24Gheorghiade M, van Veldhuisen DJ, Colucci WS. Contemporary use of digoxin in the management of cardiovascular disorders Circulation 2006; 113: 2556-64.,25Bryant B, Knights K, Salerno E. Pharmacology for Health Professionals. 2nd. Sydney Australia: Mosby Elsevier 2007.]. Digoxin is incompletely absorbed (oral dose) and has a substantial fraction cleared by kidneys [4Winter ME. Basic clinical pharmacokinetics. 4th. Philadelphia: Lippincott Williams Wilkins 2004.] with 70-85% excreted in urine unchanged [22Lemke T, Williams D, Roche V, Zito S. Foye’s principles of medicinal chemistry. 6th. Philadelphia: Lippincott Williams Wilkins 2008., 23Sonnenblick EH, LeJemtel TH, Frishman WH. Digitalis preparations and other inotropic agents In: Frishman WH, Sonnenblick EH, Eds. Cardiovascular pharmacotherapeutics. New York: McGraw Hill 1996., 25Bryant B, Knights K, Salerno E. Pharmacology for Health Professionals. 2nd. Sydney Australia: Mosby Elsevier 2007.]. The bioavailability of digoxin varies from 50% to more than 90% of the oral dose [4Winter ME. Basic clinical pharmacokinetics. 4th. Philadelphia: Lippincott Williams Wilkins 2004., 23Sonnenblick EH, LeJemtel TH, Frishman WH. Digitalis preparations and other inotropic agents In: Frishman WH, Sonnenblick EH, Eds. Cardiovascular pharmacotherapeutics. New York: McGraw Hill 1996., 25Bryant B, Knights K, Salerno E. Pharmacology for Health Professionals. 2nd. Sydney Australia: Mosby Elsevier 2007.] although this increases for gelatin capsules to nearly 100% (intravenous is assumed to be 100%) [4Winter ME. Basic clinical pharmacokinetics. 4th. Philadelphia: Lippincott Williams Wilkins 2004., 25Bryant B, Knights K, Salerno E. Pharmacology for Health Professionals. 2nd. Sydney Australia: Mosby Elsevier 2007.]. Digoxin doses are typically 0.01-0.02 mg/kg for loading doses and then 0.125-0.25 mg/day for maintenance [4Winter ME. Basic clinical pharmacokinetics. 4th. Philadelphia: Lippincott Williams Wilkins 2004.,24Gheorghiade M, van Veldhuisen DJ, Colucci WS. Contemporary use of digoxin in the management of cardiovascular disorders Circulation 2006; 113: 2556-64.] and plasma concentrations of 1-2ug/L are considered to be the limits of the therapeutic range [4Winter ME. Basic clinical pharmacokinetics. 4th. Philadelphia: Lippincott Williams Wilkins 2004., 23Sonnenblick EH, LeJemtel TH, Frishman WH. Digitalis preparations and other inotropic agents In: Frishman WH, Sonnenblick EH, Eds. Cardiovascular pharmacotherapeutics. New York: McGraw Hill 1996.] but this has been revised recently to 0.5-1 ug/L for congestive heart failure [4Winter ME. Basic clinical pharmacokinetics. 4th. Philadelphia: Lippincott Williams Wilkins 2004.]. The half life of digoxin is 1.5-2 days (36-44 hours) although this becomes prolonged in renal dysfunction [4Winter ME. Basic clinical pharmacokinetics. 4th. Philadelphia: Lippincott Williams Wilkins 2004., 20Rang H, Dale M, Ritter J, Flower R. Rang and Dale’s Pharmacology. 6th. London: Churchill Livingston 2008.-23Sonnenblick EH, LeJemtel TH, Frishman WH. Digitalis preparations and other inotropic agents In: Frishman WH, Sonnenblick EH, Eds. Cardiovascular pharmacotherapeutics. New York: McGraw Hill 1996., 25Bryant B, Knights K, Salerno E. Pharmacology for Health Professionals. 2nd. Sydney Australia: Mosby Elsevier 2007., 26Hauptman PJ, Kelly RA. Digitalis Circulation 1999; 99: 1265-70.]. Digoxin has a volume of distribution of about 7.3 L/kg but this decreases in renal disease and hypothyroidism (increases in hyperthyroidism) [4Winter ME. Basic clinical pharmacokinetics. 4th. Philadelphia: Lippincott Williams Wilkins 2004.]. Oral digoxin follows a two compartment model (Fig. 1 ); compartment one (small volume) being plasma and rapidly equilibrating tissues and compartment two (large volume) being the more slowly equilibrating tissues [4Winter ME. Basic clinical pharmacokinetics. 4th. Philadelphia: Lippincott Williams Wilkins 2004.]. Concentrations in heart, liver and skeletal muscle tends to be higher than plasma concentrations [25Bryant B, Knights K, Salerno E. Pharmacology for Health Professionals. 2nd. Sydney Australia: Mosby Elsevier 2007.] and 20-30% remains plasma bound [22Lemke T, Williams D, Roche V, Zito S. Foye’s principles of medicinal chemistry. 6th. Philadelphia: Lippincott Williams Wilkins 2008., 23Sonnenblick EH, LeJemtel TH, Frishman WH. Digitalis preparations and other inotropic agents In: Frishman WH, Sonnenblick EH, Eds. Cardiovascular pharmacotherapeutics. New York: McGraw Hill 1996., 25Bryant B, Knights K, Salerno E. Pharmacology for Health Professionals. 2nd. Sydney Australia: Mosby Elsevier 2007.]. Since cardiac effects are associated with the larger volume, plasma concentrations are not an accurate reflection of pharmacologic effects until there is equilibrium between both compartments (at least 6 hours post oral dose) [4Winter ME. Basic clinical pharmacokinetics. 4th. Philadelphia: Lippincott Williams Wilkins 2004.]. Nonetheless, the distribution half life of 35 min, onset of action (oral) of 30-120 min, and time to peak action of 6-8 hours (oral) means that pharmacological effects can be seen well before equilibrium [4Winter ME. Basic clinical pharmacokinetics. 4th. Philadelphia: Lippincott Williams Wilkins 2004.]. The ideal time to sample is 7-14 days post commencement of maintenance regime [4Winter ME. Basic clinical pharmacokinetics. 4th. Philadelphia: Lippincott Williams Wilkins 2004.]. The two compartment model for digoxin. The two compartment model for digoxin in the elderly. Digoxin has a narrow therapeutic index [1Jambhekar SS, Breen PJ. Basic pharmacokinetics. London: Pharmaceutical Press 2009., 23Sonnenblick EH, LeJemtel TH, Frishman WH. Digitalis preparations and other inotropic agents In: Frishman WH, Sonnenblick EH, Eds. Cardiovascular pharmacotherapeutics. New York: McGraw Hill 1996., 25Bryant B, Knights K, Salerno E. Pharmacology for Health Professionals. 2nd. Sydney Australia: Mosby Elsevier 2007.] so small variations in plasma concentration may readily result in toxic or sub therapeutic concentrations. Thus, consistency in bioavailability is important. Moreover, toxic symptoms can be evident with normal digoxin concentrations [25Bryant B, Knights K, Salerno E. Pharmacology for Health Professionals. 2nd. Sydney Australia: Mosby Elsevier 2007.]. Doses should be individualised based on renal function in the first instance and modified based on response and plasma concentrations [25Bryant B, Knights K, Salerno E. Pharmacology for Health Professionals. 2nd. Sydney Australia: Mosby Elsevier 2007. ]; this is more important in older people. There are numerous actions of digoxin on the heart; positive inotropism (increased contraction force), negative dromotropism (decreased conduction through the atrioventricular node), and negative chronotropism (decreased heart rate) [20Rang H, Dale M, Ritter J, Flower R. Rang and Dale’s Pharmacology. 6th. London: Churchill Livingston 2008.-23Sonnenblick EH, LeJemtel TH, Frishman WH. Digitalis preparations and other inotropic agents In: Frishman WH, Sonnenblick EH, Eds. Cardiovascular pharmacotherapeutics. New York: McGraw Hill 1996., 25Bryant B, Knights K, Salerno E. Pharmacology for Health Professionals. 2nd. Sydney Australia: Mosby Elsevier 2007., 26Hauptman PJ, Kelly RA. Digitalis Circulation 1999; 99: 1265-70.]. The inotropic action is due to digoxin inhibiting the sodium-potassium adenosine triphosphatase enzyme (Na+-K+-ATPase) which interferes with the active transport of sodium and potassium across the cell membrane [20Rang H, Dale M, Ritter J, Flower R. Rang and Dale’s Pharmacology. 6th. London: Churchill Livingston 2008.-23Sonnenblick EH, LeJemtel TH, Frishman WH. Digitalis preparations and other inotropic agents In: Frishman WH, Sonnenblick EH, Eds. Cardiovascular pharmacotherapeutics. New York: McGraw Hill 1996., 25Bryant B, Knights K, Salerno E. Pharmacology for Health Professionals. 2nd. Sydney Australia: Mosby Elsevier 2007., 26Hauptman PJ, Kelly RA. Digitalis Circulation 1999; 99: 1265-70.]. This, in turn, elevates intracellular sodium, increasing calcium availability to produce a more forceful myocardial contraction [20Rang H, Dale M, Ritter J, Flower R. Rang and Dale’s Pharmacology. 6th. London: Churchill Livingston 2008.-23Sonnenblick EH, LeJemtel TH, Frishman WH. Digitalis preparations and other inotropic agents In: Frishman WH, Sonnenblick EH, Eds. Cardiovascular pharmacotherapeutics. New York: McGraw Hill 1996., 25Bryant B, Knights K, Salerno E. Pharmacology for Health Professionals. 2nd. Sydney Australia: Mosby Elsevier 2007., 26Hauptman PJ, Kelly RA. Digitalis Circulation 1999; 99: 1265-70.]. Chronotropic effects relate to the action of digoxin on automaticity, the ability of the heart to initiate impulses with external stimuli [20Rang H, Dale M, Ritter J, Flower R. Rang and Dale’s Pharmacology. 6th. London: Churchill Livingston 2008., 21Waller D, Renwick A, Hillier K. Medical pharmacology and therapeutics. 2nd. London: Elsevier 2006., 23Sonnenblick EH, LeJemtel TH, Frishman WH. Digitalis preparations and other inotropic agents In: Frishman WH, Sonnenblick EH, Eds. Cardiovascular pharmacotherapeutics. New York: McGraw Hill 1996., 25Bryant B, Knights K, Salerno E. Pharmacology for Health Professionals. 2nd. Sydney Australia: Mosby Elsevier 2007., 26Hauptman PJ, Kelly RA. Digitalis Circulation 1999; 99: 1265-70.]. Therapeutic plasma concentrations of digoxin decrease automaticity while toxic doses can have the opposite effect and increase automaticity [20Rang H, Dale M, Ritter J, Flower R. Rang and Dale’s Pharmacology. 6th. London: Churchill Livingston 2008., 21Waller D, Renwick A, Hillier K. Medical pharmacology and therapeutics. 2nd. London: Elsevier 2006., 23Sonnenblick EH, LeJemtel TH, Frishman WH. Digitalis preparations and other inotropic agents In: Frishman WH, Sonnenblick EH, Eds. Cardiovascular pharmacotherapeutics. New York: McGraw Hill 1996., 25Bryant B, Knights K, Salerno E. Pharmacology for Health Professionals. 2nd. Sydney Australia: Mosby Elsevier 2007., 26Hauptman PJ, Kelly RA. Digitalis Circulation 1999; 99: 1265-70.]. Dromotropic effects relate to the action of digoxin on reducing conduction velocity (directly through atrioventricular node and indirectly through vagal action) and prolonged refractory period [20Rang H, Dale M, Ritter J, Flower R. Rang and Dale’s Pharmacology. 6th. London: Churchill Livingston 2008., 21Waller D, Renwick A, Hillier K. Medical pharmacology and therapeutics. 2nd. London: Elsevier 2006., 23Sonnenblick EH, LeJemtel TH, Frishman WH. Digitalis preparations and other inotropic agents In: Frishman WH, Sonnenblick EH, Eds. Cardiovascular pharmacotherapeutics. New York: McGraw Hill 1996., 25Bryant B, Knights K, Salerno E. Pharmacology for Health Professionals. 2nd. Sydney Australia: Mosby Elsevier 2007., 26Hauptman PJ, Kelly RA. Digitalis Circulation 1999; 99: 1265-70.]. There are also potential benefits of digoxin in the aging patient. Laudisio et al. [27Laudisio A, Marzetti E, Pagano F, Cocchi A, Bernabei R, Zuccalà G. Digoxin and cognitive performance in patients with heart failure: a cohort pharmacoepidemiological survey Drugs Aging 2009; 26: 103-2.] reported cognitive improvement in patients treated with digoxin. Importantly, cognitive dysfunction is a common co-morbidity in heart failure patients [27Laudisio A, Marzetti E, Pagano F, Cocchi A, Bernabei R, Zuccalà G. Digoxin and cognitive performance in patients with heart failure: a cohort pharmacoepidemiological survey Drugs Aging 2009; 26: 103-2., 28Vogels R, Scheltens P, Schroeder-Tanka JM, Weinstein HC. Cognitive impairment in heart failure: A systematic review of the literature European J Heart Failure 2007; 9: 440-9.]. The cognitive improvement in digoxin therapy relates to the role endogenous cerebral digoxin plays in neuronal sodium dependent transport of calcium [27Laudisio A, Marzetti E, Pagano F, Cocchi A, Bernabei R, Zuccalà G. Digoxin and cognitive performance in patients with heart failure: a cohort pharmacoepidemiological survey Drugs Aging 2009; 26: 103-2.]. The study involved more than 1100 patients with heart failure and showed cognitive improvement in 25% of digoxin patients and only 16% of non digoxin patients (P < 0.001). In those without heart failure (more than 2400), digoxin improved cognition in 23% compared to just 17% in those untreated (P < 0.001). The investigators corrected for confounders and reported an odds ratio for improving cognition of 1.7 (95% confidence interval of 1.2 to 2.4) for patients with heart failure but only 1.1 (95% CI of 1.0 to 1.3) for those without heart failure. Thus, digoxin therapy appears to selectively improve cognitive performance among older patients with heart failure. Aging results in prolonged elimination half life and decreased volume of distribution for digoxin [3Ritschel WA, Kearns GL. Handbook of basic pharmacokinetcis including clinical applications. 6th. Washington: American Pharmacists Association 2004.]. A recent examination of more than 1000 nursing home residents in Canada showed that 32% of elderly heart failure patients are treated with digoxin, 80% of those received doses higher than recommended, serum digoxin levels were higher than toxic levels in 30% of patients, and 26% had other medications known to be high risk of digoxin interaction prescribed [29Misiaszek B, Heckman GA, Merali F, et al. Digoxin prescribing for heart failure in elderly residents of long-term care facilities Can J Cardiol 2005; 21: 281-6.]. The most important age related change is that of deterioration of renal function and this is especially true for digoxin where poorer renal excretion demands lower dosage to avoid toxicity [17Tsang P, Gerson B. Understanding digoxin use in the elderly patient Clin Lab Med 1990; 10: 479-92.]. This is reflected in some early research in normal young and old populations [31Korkushko OV, Orlov PA, Bezverkhaia IS, Belyi AA. Effect of age on the pharmacokinetic parameters of digoxin Farmakol Toksikol 1984; 47: 101-4.]. 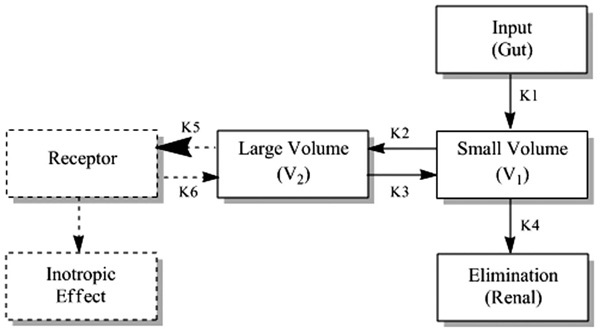 Using the two compartment model described above, the transfer constant from small to large compartments was increased, elimination was decreased and both of the compartmental volumes of distribution reduced. Fig. (2 ) provides an overview of the two compartment model for digoxin in older people and the two compartments. Ewy et al. [32Ewy GA, Kapadia GG, Yao L, Lillin M, Marcus FI. Digoxin metabolism in the elderly Circulation 1969; 39: 449-53.] reported digoxin clearance of 53 ml/min/1.73m2 in older (73-81 years) men and 83 ml/min/1.73m2 in younger men (20-33 years). In a comparison of the pharmacokinetics of digoxin in young (34-61 years) and older (72-91 years) people, Cusack et al. [33Cusack BJ, Kelly J, O’Malley K, Noel J, Lavan J, Horgan J. Digoxin in the elderly: pharmacokinetic consequences of old age Clin Pharmacol Ther 1979; 25: 772-6.] reported a longer biological half life (37 to 70 hours), longer bioavailability (90 to 145 nmol/ml/hr), lower absorption (84% to 76%), decreased volume of distribution (5.3 to 4.1 L/Kg) and slower plasma clearance (106 to 37 ml/min) for the older cohort. The symptoms of digoxin toxicity in the elderly are protean with the more common features including anorexia, cognitive changes, hazy vision, and arrhythmia [3Ritschel WA, Kearns GL. Handbook of basic pharmacokinetcis including clinical applications. 6th. Washington: American Pharmacists Association 2004., 25Bryant B, Knights K, Salerno E. Pharmacology for Health Professionals. 2nd. Sydney Australia: Mosby Elsevier 2007.]. The latter three are not typical of digoxin toxicity in younger populations (anorexia and vomiting) and are consistent with numerous other physiological or pathological process in the elderly (poor specificity) making diagnosis of toxicity difficult [10Kostrzewski A. Cardiovascular medicines in the elderly In: Armour D, Cairns C, Eds. Medicines in the elderly. London: Pharmaceutical Press 2002., 19Hanratty CG, McGlinchey P, Johnston GD, Passmore AP. Differential pharmacokinetics of digoxin in elderly patients Drugs Aging 2000; 17: 353-62., 30Passmore AP, Johnston GD. Digoxin toxicity in the aged. Characterising and avoiding the problem Drugs Aging 1991; 1: 364-79.]. Serum digoxin concentrations are a good marker for toxicity but should be interpreted with heavy weighting on clinical judgement because serum concentrations are not always a good indicator of toxicity [30Passmore AP, Johnston GD. Digoxin toxicity in the aged. Characterising and avoiding the problem Drugs Aging 1991; 1: 364-79.]. This partly relates to the wide variety of co-morbid conditions and medications that can interfere with the reliability of the serum measurement of digoxin; factors more prevalent in the elderly. With reference to the two compartment model, serum concentrations reflect the small volume while the pharmacologic effects and toxicity are associated with the larger volume. Thus, it is particularly important that equilibrium between the two compartments is reached before serum concentrations are measured. The time to equilibrium can be variable and in the elderly it can be delayed. Serum digoxin concentrations, then, may be less reliable for up to several weeks after commencement of digoxin therapy or indeed a change in dosage making assessment of both response to treatment and toxicity in this window difficult. Moreover, low serum concentrations are known to present difficulties in assay. Despite that limitation, the sympatholytic effects of digoxin can be achieved at concentrations well below those required for a positively inotropic effect [26Hauptman PJ, Kelly RA. Digitalis Circulation 1999; 99: 1265-70.]. In the elderly, increased sensitivity to digoxin may lead to inotropic effects at low concentrations. Furthermore, in older patients (60+ years) dosages based on the Cockcroft-Gault equation do not predict serum concentrations [9McLean AJ, Le Couteur DG. Aging biology and geriatric clinical pharmacology Pharmacol Rev 2004; 56: 163-84.]. This, the tool designed to modify digoxin dosage to accommodate the alterations associated with aging, are not reliably informed by serum assays. This reflects the lack of ability of the serum concentration to predict the complex pharmacokinetic and pharmacodynamic behaviour in the elderly. start doses low and escalate slowly. While digitalis has been used therapeutically for more than 200 years, ACE inhibitors combined with a diuretic are the current first-line therapy for the management of heart failure. Nonetheless, digoxin has an important role in patients who do not respond to these medications. Digoxin has a particularly important role in older sufferers of heart failure because it reduces the number of hospital admissions associated with escalation of symptoms. This, in conjunction with the increased incidence of heart failure in older people and the aging population, mean the digoxin will continue to be an important and frequently prescribed medication in older people. In the elderly, special consideration and dispensation needs to be applied for digoxin’s narrow therapeutic index, co-morbid diseases, polypharmacy and altered pharmacokinetics to minimise toxicity and sub-optimal therapy. Jambhekar SS, Breen PJ. Basic pharmacokinetics. London: Pharmaceutical Press 2009. Shargel L, Wu-Pong S, Yu ABC. Applied biopharmaceutics and pharmacokinetics. 5th. New York: McGraw Hill 2005. Ritschel WA, Kearns GL. Handbook of basic pharmacokinetcis including clinical applications. 6th. Washington: American Pharmacists Association 2004. Winter ME. Basic clinical pharmacokinetics. 4th. Philadelphia: Lippincott Williams Wilkins 2004. Cusack BJ. Pharmacokinetics in older persons Am J Geriatr Pharmacother 2004; 2: 274-302. Delafuente JC. Pharmacokinetic and pharmacodynamic alterations in the geriatric patient Consult Pharm 2008; 23: 324-4. El Desoky ES. Pharmacokinetic-pharmacodynamic crisis in the elderly Am J Ther 2007; 14: 488-98. Ewing AB. Altered drug response in the elderly In: Armour D, Cairns C, Eds. Medicines in the elderly. London: Pharmaceutical Press 2002. McLean AJ, Le Couteur DG. Aging biology and geriatric clinical pharmacology Pharmacol Rev 2004; 56: 163-84. Kostrzewski A. Cardiovascular medicines in the elderly In: Armour D, Cairns C, Eds. Medicines in the elderly. London: Pharmaceutical Press 2002. Mangoni AA, Jackson SHD. Age-related changes in pharmacokinetics and pharmacodynamics: basic principles and practical applications Br J Clin Pharmacol 2003; 57: 6-14. Durnas C, Loi CM, Cusck BJ. Hepatic drug metabolism and aging Clin Pharmacokinet 1990; 19: 359-89. Wynne H. Drug metabolism and ageing J Br Menopause Soc 2005; 11: 51-6. Turnheim K. When drug therapy gets old: pharmacokinetics and pharmacodynamics in the elderly Exp Gerontol 2003; 38: 843-53. Goodyer LI. Compliance, concordance and polypharmacy in the elderly In: Armour D, Cairns C, Eds. Medicines in the elderly. London: Pharmaceutical Press 2002. Brawn LA, Castleden CM. Adverse drug reactions. An overview of special considerations in the management of the elderly patient Drug Saf 1990; 5: 421-35. Tsang P, Gerson B. Understanding digoxin use in the elderly patient Clin Lab Med 1990; 10: 479-92. Aronow WS, Frishman WH, Cheng-Lai A. Cardiovascular drug therapy in the elderly Heart Dis 2000; 2: 151-67. Hanratty CG, McGlinchey P, Johnston GD, Passmore AP. Differential pharmacokinetics of digoxin in elderly patients Drugs Aging 2000; 17: 353-62. Rang H, Dale M, Ritter J, Flower R. Rang and Dale’s Pharmacology. 6th. London: Churchill Livingston 2008. Waller D, Renwick A, Hillier K. Medical pharmacology and therapeutics. 2nd. London: Elsevier 2006. Lemke T, Williams D, Roche V, Zito S. Foye’s principles of medicinal chemistry. 6th. Philadelphia: Lippincott Williams Wilkins 2008. Sonnenblick EH, LeJemtel TH, Frishman WH. Digitalis preparations and other inotropic agents In: Frishman WH, Sonnenblick EH, Eds. Cardiovascular pharmacotherapeutics. New York: McGraw Hill 1996. Gheorghiade M, van Veldhuisen DJ, Colucci WS. Contemporary use of digoxin in the management of cardiovascular disorders Circulation 2006; 113: 2556-64. Bryant B, Knights K, Salerno E. Pharmacology for Health Professionals. 2nd. Sydney Australia: Mosby Elsevier 2007. Hauptman PJ, Kelly RA. Digitalis Circulation 1999; 99: 1265-70. Laudisio A, Marzetti E, Pagano F, Cocchi A, Bernabei R, Zuccalà G. Digoxin and cognitive performance in patients with heart failure: a cohort pharmacoepidemiological survey Drugs Aging 2009; 26: 103-2. Vogels R, Scheltens P, Schroeder-Tanka JM, Weinstein HC. Cognitive impairment in heart failure: A systematic review of the literature European J Heart Failure 2007; 9: 440-9. Misiaszek B, Heckman GA, Merali F, et al. Digoxin prescribing for heart failure in elderly residents of long-term care facilities Can J Cardiol 2005; 21: 281-6. Passmore AP, Johnston GD. Digoxin toxicity in the aged. Characterising and avoiding the problem Drugs Aging 1991; 1: 364-79. Korkushko OV, Orlov PA, Bezverkhaia IS, Belyi AA. Effect of age on the pharmacokinetic parameters of digoxin Farmakol Toksikol 1984; 47: 101-4. Ewy GA, Kapadia GG, Yao L, Lillin M, Marcus FI. Digoxin metabolism in the elderly Circulation 1969; 39: 449-53. Cusack BJ, Kelly J, O’Malley K, Noel J, Lavan J, Horgan J. Digoxin in the elderly: pharmacokinetic consequences of old age Clin Pharmacol Ther 1979; 25: 772-6.